A routine grounder to short sealed the deal. It’s Tuesday, Oct. 4, 1955. An 11-year-old James Devlin has just finished up his school day at St. Catherine of Alexandria, Boro Park, and he can sense the excitement in the Brooklyn air. That’s because that routine grounder off the bat of Elston Howard was gobbled up by Pee Wee Reese for the final out of the 1955 World Series, in which the Brooklyn Dodgers defeated the mighty New York Yankees in seven games to be crowned world champions. Devlin, now Father James Devlin, pastor emeritus of Good Shepherd parish, Marine Park, can still recall his memories – and even the starting lineups – of that series and what it meant to the borough. Growing up in Boro Park, baseball became a way of life for Father Devlin from an early age. He was an outfielder for the Catholic Youth Organization teams at St. Catherine’s and was lucky enough to attend a few Dodgers games at Ebbets Field in Crown Heights. What a time it was to be a baseball fan in Brooklyn. Following the likes of Jackie Robinson, Gil Hodges, Roy Campanella Don Newcombe, Duke Snider and Carl Furillo had to have been such a thrill for young Father Devlin. But when it came to the World Series, it was always “Wait ‘til next year!” The heartbreaking moments piled up for Dodgers fans through the late 1940s and early 1950s. In September 1955 with the Dodgers maintaining a comfortable lead for the National League pennant, Devlin’s older sister Sheila, also a huge Dodgers fan, entered the convent as a religious nun. Devlin’s mother, Dolly, always told him that when he entered a new church – as he did to see his sister profess her final vows – he could make a wish. That wish seemed like a long shot after the Yankees won the first two games of the best-of-seven series at Yankee Stadium in the Bronx. Most Dodgers fans thought the series was already over, but hope was not entirely lost as the series shifted to Brooklyn for the next three games. In Game 3, Dodgers lefty Johnny Podres pitched a complete-game for the victory. A 14-hit outburst, including home runs by Campanella, Hodges and Snider, gave Brooklyn a win in Game 4. The Dodgers then hung on for a close win in Game 5. By the sixth inning, Brooklyn hero Hodges had driven in two runs to give the Dodgers a 2-0 lead. In the bottom of the inning, the Yankees had a rally going. 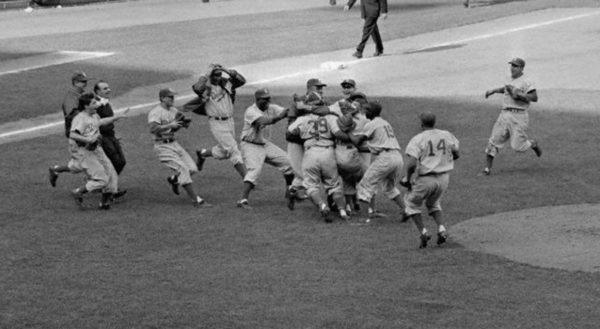 A deep fly ball off the bat of Yogi Berra seemed destined for the left field corner, but Dodgers left fielder Sandy Amorós made a miraculous catch and doubled-off the runner at first base to save the game. Podres again turned in a masterful performance, a complete-game shutout to clinch the World Series title. For his efforts, he was named World Series M.V.P. – the first year the award was ever given. It was this World Series that piqued Father Devlin’s interest in baseball, which has devoutly continued to this day. Now a New York Mets fan, Father Devlin’s time rooting for the Dodgers has prepared him well for the heartbreak associated with following the Amazins’ – especially the past few seasons. But at least he’ll always have those boyhood memories of when “next year” became “this year” for the 1955 Brooklyn Dodgers.